Eager to get out of Louisiana, we knew we wanted to head towards Forth Worth, Texas. Why? Well, you may remember last August when we picked up a tiny shiny home from a sweet man named William. Well, I contacted him to see if we could come by for the weekend to show him the changes we made to his old trailer. It was a bit of a gamble. I wasn’t sure if he’d be happy about our renovation. Or, what if it would be too hard for him to see all the changes? He said he would love to meet us and come see it. I hope he likes our changes and that he will know how much we love it and how great of a fit it is for our little family. Forth Worth was quite the haul from Louisiana so we opted for a quick overnight stay at Huntsville State Park. What an adorable park. We sure do love state parks but Texas really gets you with their DAILY entrance fees for campers. SO EXPENSIVE. We forgot that when we booked our site. However, if you do get into Huntsville State Park, we ended up with a great site that I wanted to share with you. Raven Hill Camping Area, site #10! Its a gem. Huge back yard for the kids to play, picnic table, fire pit. Trees for hammocks. It was great. It also helped that our neighbors were sweet had a bunch of kids that were eager to play. I love coming across families traveling full time. It’s so neat to hear their WHY. Each of us has our own reasons we ditched suburbia and it’s so neat to learn from each other. The next morning we loaded up and headed towards Fort Worth. With it being spring break, not many of our top choices to camp were available so we ended up at a KOA for a couple nights. The only good part about that was meeting this guy. Russ the Big Guy and his 1957 Caravanner. He was finishing up a 2 month trip and headed back home to New York. He is an artist and offered to draw us as cartoons. The kids loved it and it was so nice getting to meet him an take a look at his rig. He even weathered out a tornado IN HIS AIRSTREAM. It actually picked it up and moved it. Crazy. It was great to meet you Russ, and thank you for the drawing! The day had finally come! We have been looking forward to showing William the Airstream for quite some time. 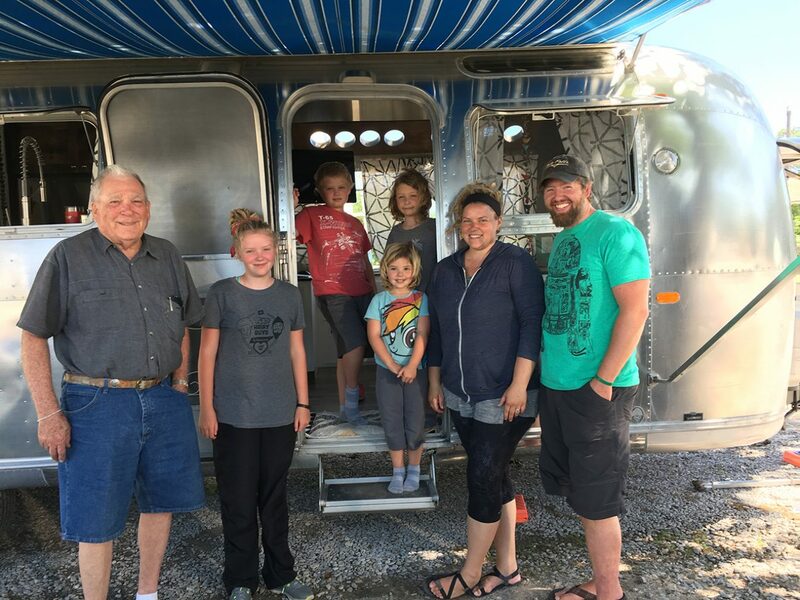 He also brought his family, most of which were there when we bought the Airstream last year. It was nice seeing how much they loved what we had done. How it basically remained the same layout, just updated and a perfect fit for our little family. We listened to him talk about his favorite places he and his wife had been, and how much this trailer meant to him. It was a really great day. One question we had been dying to ask is where he bought the decorative screen door piece. We had been researching online trying to find out if it was original to the 1972 Sovereign or not. Turns out, his wife had been after him to put something on it so he took a screen door from his house and cut it to fit the space. It’s a unique piece, and it’s not going anywhere! It was so nice to catch up with William and his family and know that we have his blessing on this journey. Now, time to go adventuring!